Views from Sage Hill Inn: Holiday Fun in the Texas Hill Country! Holiday Fun in the Texas Hill Country! It's hard to ignore the fast approach of the holidays, with all of this chilly weather here in the Texas Hill Country. We are making hardy preparations for our Inn Above Onion Creek Thanksgiving this week and Christmas isn't too far behind. 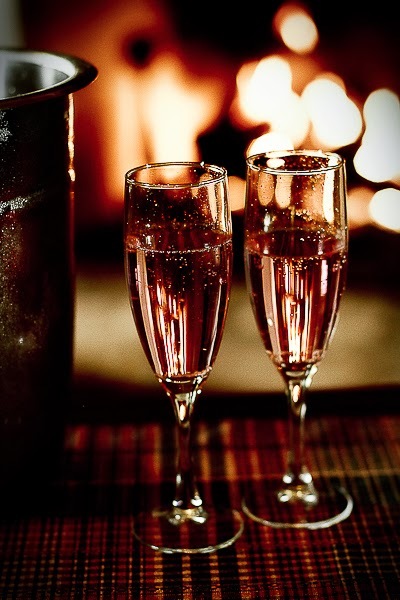 Champagne in front of the Inn's dining room fireplace. We want to make sure our guests have the most memorable and festive time they can have during their stay, so in addition to the roaring fireplaces in every room, the Inn's cheery lights and comforting home cooked meals, here is a short compilation of all of the fantastic holiday events happening in our area. With over 100 sellers, a pizza bar, a photo booth and a comfy vintage lounge area you're bound to find the perfect gift for your someone special while have a good deal of fun while you're at it. There is plenty to do and see at Lockhart's "A Dickens' Christmas in Lockhart" festival , including Victorian garbed vendors, carriage rides, street performers, music, food and even the lighting of a yulelog. The festival starts with a "Lighted Christmas Parade" at 7pm on Friday and continues on into Saturday starting at 9:00am. Sights and Sounds is an annual tradition in San Marcos and draws over 7,000 people each year. In addition to the beautiful lights that are strung up around the San Marcos river, there is also live music, hot cocoa, food, arts and crafts booths and plenty of holiday cheer. This year mark's Austin's 49th Annual Trail of Lights. Every year, Zilker park's 1.25 mile trail is transformed into a show-stopping winter wonderland of light displays and holiday merriment. In addition to the beautiful lights displays are the headlining musical acts, food vendors and live artist demonstrations. On the second weekend of December, Bastrop will hold their annual Lost Pines Christmas - four joyous days filled with wine and food tastings, a River of Lights, holiday shopping, a holiday tour of homes and a farmer's market.